when you make him see what he is like. Reybert Ramos continues to tackle the complexity and diversity that pop culture has brought into the Manila contemporary. 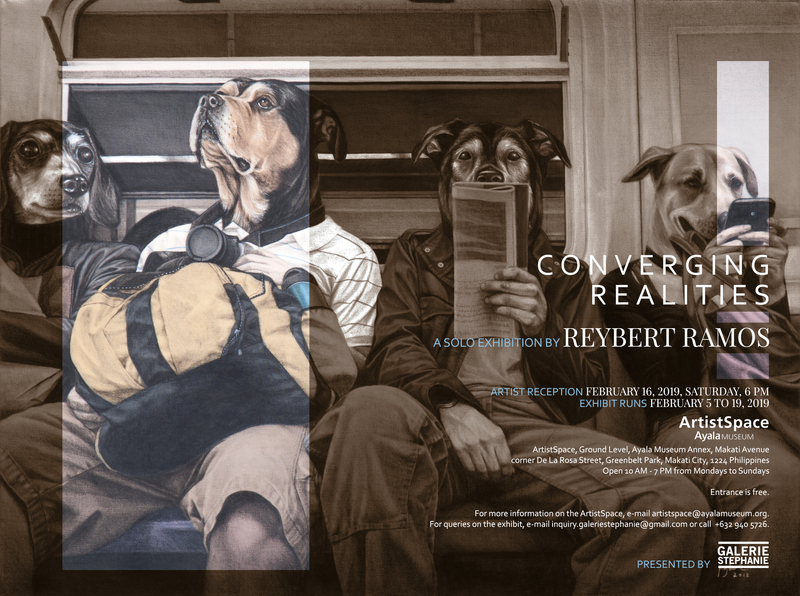 Drawing inspiration from double meanings and stereotypes, Reybert presents “Converging Realities” as a social evaluation and correction of the modern individual. Moreover, Reybert fuels his fifth solo exhibit with various symbolisms, criticisms, and paradoxes about human nature as it springboards from the power of media, politics, and moral responsibilities. 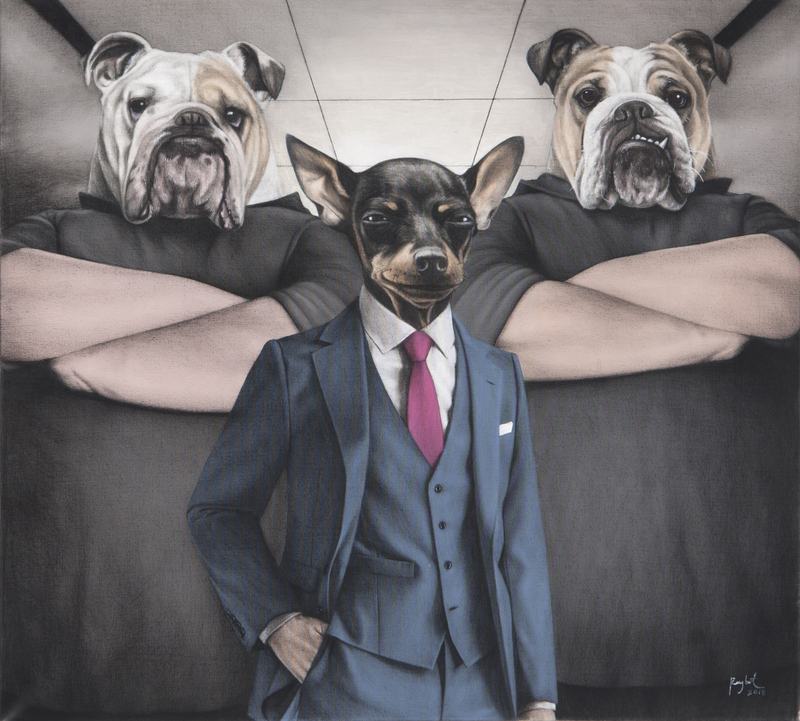 Despite the strong social realism present in the artworks, Reybert pushes his audience to deduce the symbolisms incorporated in his dog-human hybrids, particularly those that are narrative in nature. An instance would be the “Daily Grind”, where the subjects create a crowd of isolated individuals—representing diversity of a common struggle. 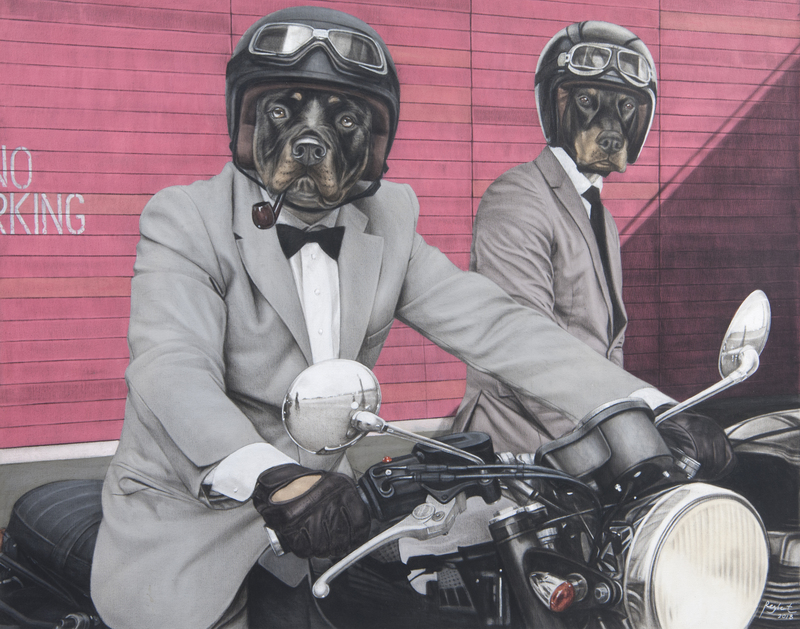 “Distinguished Gentlemen”, on the other hand, is an attack on stereotypes using the motorcycle as a misinterpreted vehicle of violence associated with biker gangs or other criminal activities. Reybert redefines these associations with utilitarianism instead, that their realities were distorted with societal prejudices. “Converging Realities” stands as the artist’s advocacy to continue to question the social predicaments that shape human nature. And with the strong impact of social media, renewing perspectives or breaking stereotypes comes off like a futile force. 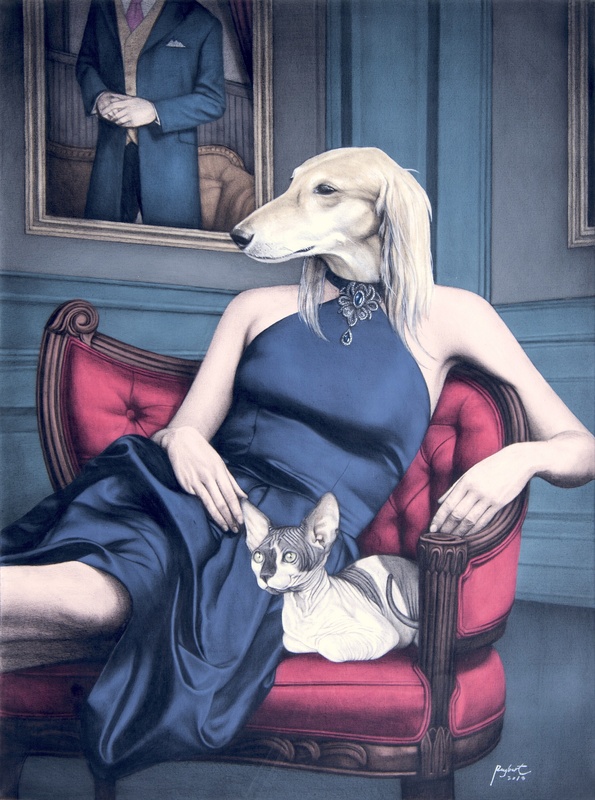 Reybert then ingeniously makes these associations malleable instead through his art, reshaping its essence as it triggers a deeper and more implicit familiarity, subtly manifested in the dogs’ characteristics. This exhibit marks the artist’s development of creating finer details both literally and figuratively, exposing the unorthodox characters as the true identities that they actually are. Reybert Ramos (b. 1981) is a graduate of Visual Communication at the University of the Philippines Diliman, and an alumnus of Makiling School for the Arts. He has been exhibiting actively both locally and internationally, as he fulfills his duties as an art director in a major broadcasting corporation. Aside from his numerous group shows in the Philippines, his socially infused artworks have also reached the international platform through Art Fair Tokyo and Art Stage Singapore (solo show). Reybert continues to enunciate his pop culture-infused satires through his distinct hyperrealist hybrids, pushing his artistic career into a more socially profound and recognized level. “Converging Realities” will be on view at the ArtistSpace in Ayala Museum, Makati, from February 5 to 19, 2019. The reception will be on February 16 (Saturday), 6pm. For inquiries kindly call Galerie Stephanie at 940-5726 or email inquiry.galeriestephanie@gmail.com.